by CK Dexter Haven. Music, drink, food, and more. Living the good life in all of its many forms. Rock, Jazz, World Music, etc. To RISE and REMEMBER: Making Easter Bread has been a family’s holiday tradition for 71 years. Timothy Mangan, renowned classical music critic and friend of All is Yar, recently published a piece in the Orange County Register titled “Concert etiquette baffling? Here’s a hand.” It does a splendid job demystifying and explaining the classical music and opera attendance experience for newbies and veterans alike. The two biggest topics he covers: appropriate dress and appropriate time to applaud. I would only add one more recommendation with regards to deciding when to applaud at classical music concerts (not operas). 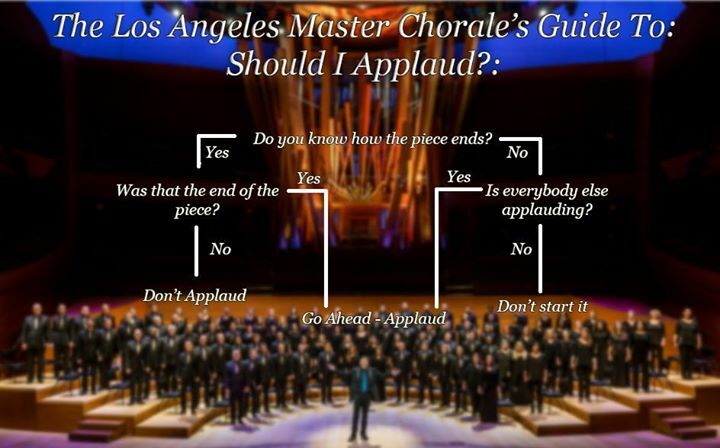 It is something I learned as a 6th grader in Long Beach — ah, those were the days, when such things were taught in public schools — and it has served me well my whole life: don’t applaud until the conductor turns around and faces the audience. It works brilliantly for all occasions. Not only does it solve the problem of trying to figure out whether or not a quick stop or instance of silence is actually the end of the piece vs. a mid-movement or inter-movement pause (e.g. the end of the “Infernal Dance” during The Firebird by Stravinsky), it also prevents you from ruining a quiet ending when the conductor is trying to let the last note hang for as long as possible to milk the drama for all it’s worth (e.g. Tchaikovsky 6th, Mahler 9th). Just my $0.02 contribution to Mr. Mangan’s wealth of helpful information. UPDATE (15 October 2015): the LA Master Chorale shared this picture on their Facebook page . . . Tags: concert etiquette, Timothy Mangan. Bookmark the permalink. I have seen your blog really fantastic. Thanks for sharing your nice information. My blog has recently been added to Best Music Blogs, which is part of one of the largest networks of blog directories on the Web. Please visit my blog's personal page to vote for my blog and comment to other blog users.